A walk in the park, with… your supervisor? A very commonly discussed issue in our postgraduate forums is the relationship between postgraduate researchers and their supervisors. Misunderstandings, failures to realize different contexts, cultural differences, divergent beliefs, are often reported as obstacles which lead to conflicts of what should have been fundamentally established as an excellent communicative relationship. The result? The weaknesses of such relationships most probably will leave their traces on our actual… writing! Let’s not forget, the biggest common goal of both sides is the implementation of your thesis! During the last couple of months (academically translated into: “during the last year that I have been struggling to cross a paragraph in my literature review!”), I have been feeling the causes that the sedentary lifestyle which any Ph.D. merely requires, on my physical health. Apart from a nostalgia for the active lifestyle I used to have as an athlete, I have been trying to think of ways in which academic life can become… more active on a daily basis. I bet this is the case with most postgraduate students, regardless the topic of their Ph.D.
Paradoxical as it sounds, I negotiate the “body-mind” theory (drawing on Dewey’s thoughts) within my own thesis, while I feel I myself have been succumbed to the “seating-mind” one! Moreover, I extensively advocate in my thesis the “place-and-community-based education” (based on Smith & Sobel) while I am observing how much anxiety the “office-and-university-based lifestyle” has brought in… my own education. As a result, I decided to ask my supervisor to go for a walk during our last supervision. Not only did she gladly accept, but it was a great chance for her to take out her dog for a walk as well! We walked around Seaton Park, which is a lovely park, full of flowers, trees, and a nice river, nearby the University. In a magic way, the so-called impermeable authority that otherwise a supervisor would have, disappeared during our walk and the respect towards another person’s opinions who has considerable experience and knowledge in the field took its place. The hierarchical roles that seem to be supported by the material structures (supervisor’s office, desk, chairs, books etc) fall away in the new space of the outdoors, where the paraphernalia of academia are stripped away. The fresh air which cleared our minds while loads of laughter released my (our?) stress, established so naturally a wonderful –not only setting, but also process of a supervision meeting. “Super” + “vision”? Not at all there! You might discover the same: that behind the title of a “super” visor a really simple and in fact, pretty cool person can be hidden! The dog’s contribution during the supervision! Believe it or not, this dog had a character which undoubtedly seemed to be closer to a Deweyan’s: a “progressive” terrier that loves “experiential learning”, “learning by doing”, through its… “paw-on” (substitute of a “hands-on”) approach. This dog, namely Skye, proudly affirms her identity as a terrier, which in fact means <ground dog> while the word emerges from the Latin <terrarius> = of the earth, while <terra> from Latin means earth. Also, while playing with other dogs freely on the fields, her dog philosophy around the fact that reality must be experienced reflected her deeply “pragmatic” character… There is no question; she had absolutely no fear about where she should go! 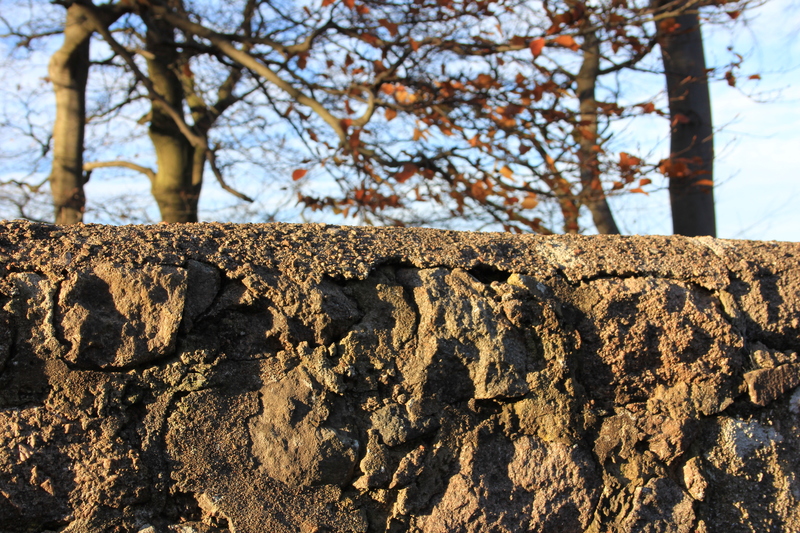 The “wall” outside Seaton Park: Aberdeen. The first lens is focused on nature, while the “wall” is still here. 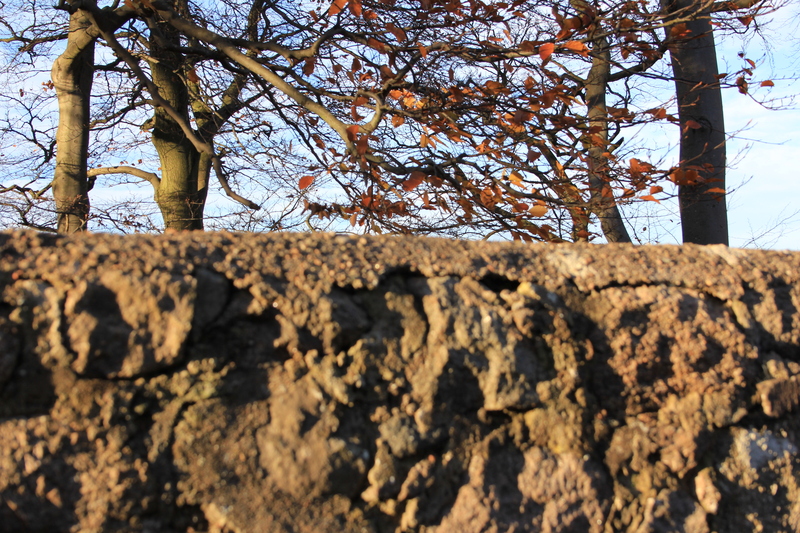 The second one is focused on the wall but then it is impossible to see nature clearly behind. A question we should ask ourselves: how we see our world. For this, none of a scientific methodology is required or is even enough, but rather, a daily reflection on ourselves of “how” we collaborate with the people around us. I officially propose to my supervisors to have systematically our supervision meetings outside from now onwards. Moreover, whenever the need of note-taking or reading is in the center of our meetings we could use outdoors as a preferable space, or when the feedback is exclusively based on a discussion the meetings outside could simply take the form of walks in a park, at least until we get tired! I propose to all of you who have supervisors and perhaps face problems in your between relationships, to take your supervisors from their hand and go for a walk together. You have absolutely nothing to lose! Everyone needs a walk during an academic day in any case, why shouldn’t be you the ones who could give them this chance as a nice gift, instead of keeping them for “another meeting” closed in their offices. Talking whilst talking, not only can be proved to help your understanding of each other but can work in an inspiring way of building up your ideas. Gray, D.S. (2012). Walking in the mindfield or the classroom as a Cartesian constraint: the reunification of body, mind and nature. International Journal of Holistic Education, vol. 1, no. 1, pp. 1-8. This is a great idea, but the quastion is how many supervisors are wiling to have their supervision in an open space, especially if they were attached to material structure? That is a great question, thank you Sheryl for this contribution. I liked the idea very much and also liked your writing! Happy blogging! Thank you very much Matluba, you are a great blogger yourself around similar issues and it is an honour to get your priceless feedback! Eco School: H Μπλε Μέλισσα is now... here!